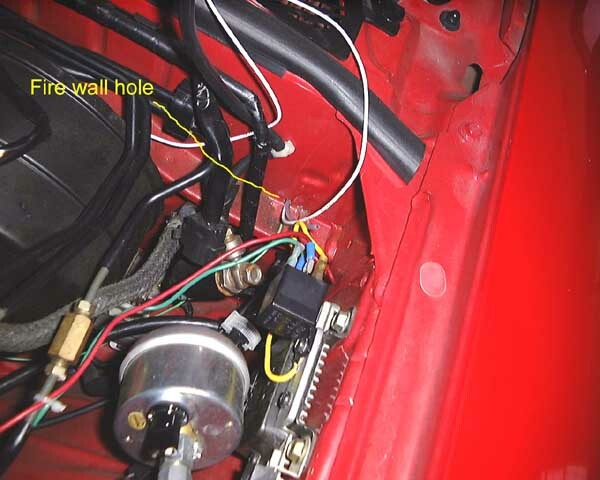 You can also go through the same two holes in the driver side fender well as a battery relocation cable. I used a small piece of 1/8 inch tubing (same type as used by boost gauge) to fish the wires through. 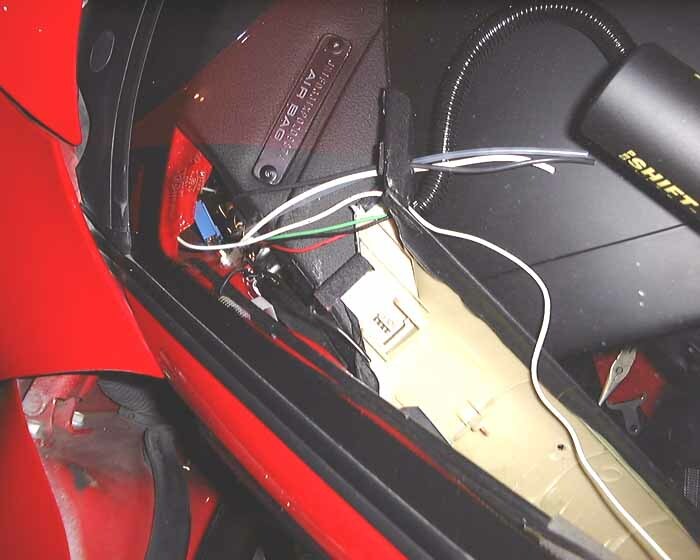 Just shove the wire into the tube, put on a small piece of tape to hold the wire in, and shove it through to the interior. The AutoMeter A-pillar pod's lower lip slides down into the A-pillar trim slot, so you only have to secure the top. It comes with little plastic buttons (see picture). Just drill two holes through the pod and A-pillar trim piece and it's secure. AutoMeter also sells a single pod. 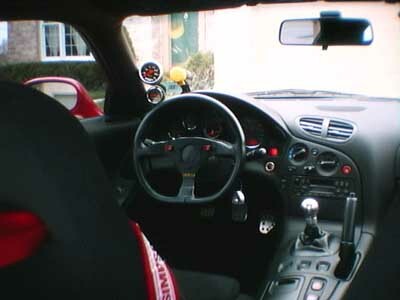 Just drill a small hole in the gauge mounting cup and the A-pillar trim piece. I used a small (1/8 inch I think) flat head nut and bolt. If you don't use a flat head the head will keep the gauge from fitting into the cup. 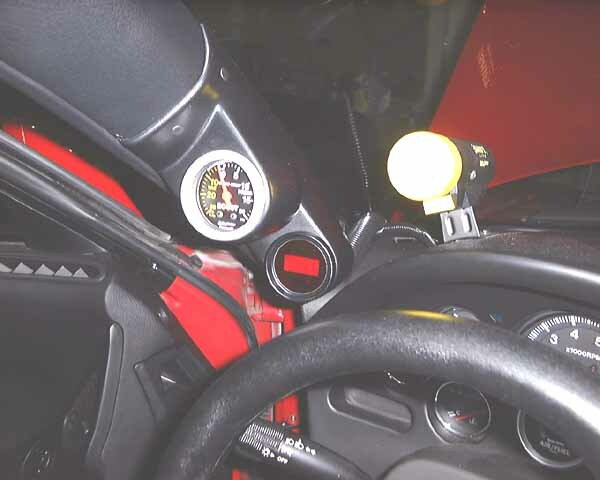 The bolt goes into the gauge cup then through a small rubber grommet (to reduce vibration), then through the A-pillar trim, then a washer or backing plate then a nut. Be sure to use a Nylock nut or Locktite to keep the nut tight. You have to be careful how you mount the gauge. My large gauge would hit the window on really big bumps. I like this mounting option. 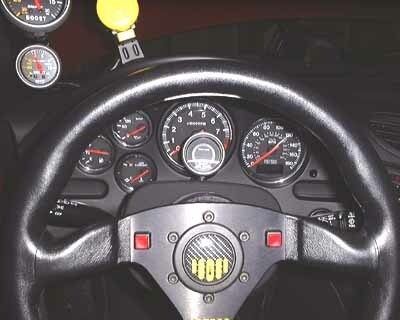 It doesn't block the tachometer (but the steering wheel does). Just remove the bolts from the bottom of the steering column cover then snap off the top. Follow the instructions above for A-pillar mounting (same flathead nut and bolt and grommet).